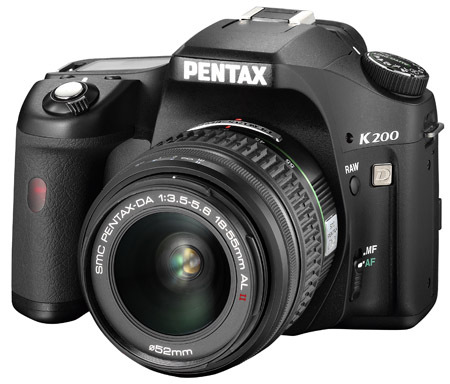 Review Pentax is pretty clear about the target group for the K200D: the head of a family and digital camera beginner. Automation is the key here – most folk will simply want a camera they can pick up and shoot. The first thing that hits you about the K200D is its size. Pentax describes it as “one of the most compact DSLRs on the market”, but we beg to differ. Compared with, say, the Nikon D40, the K200D seems large. Compared with your typical compact, it's enormous. And, at 630g, it’s also quite weighty – and that’s before you add the lens and batteries. In fact, put a K200D in each hand, start pumping those arms and you’ll soon have biceps Arnold Schwarzenegger would be proud of. Its dimensions, by the way, are 133 x 95 x 74mm. That said, the K200D feels nice and solid - it’s made of fibreglass-reinforced polycarbonate. What’s more, Pentax has made it pretty robust by hermetically sealing it with 60 seals on the body and 14 more on the camera grip. True, you couldn’t take the K200D on a dive without proper water protection, but if you’re shooting in snow or on a beach, you can feel pretty relaxed about sand or moisture.